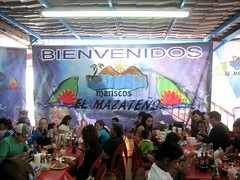 My last trip to Tijuana with Street Gourmet LA took me back to Mariscos El Mazateno, a Sinaloan seafood taqueria. I came here on my first trip to TJ, but back then I was even weaker to spicy food as I am now so it was nice to revisit and enjoy it even better this time. The must order here is the Taco Mazatena (shrimp/camarones enchilado), a taco packed full of fresh, crisp, lightly spicy shrimp. 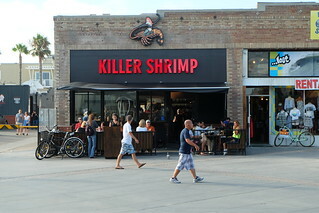 If you walk by the kitchen, you can see them cooking the spicy shrimp in a giant pot. Dress this with the available condiments including cabbage, crema, pico de gallo, and a bottle of house made spicy green sauce made with avocado and serrano chili. 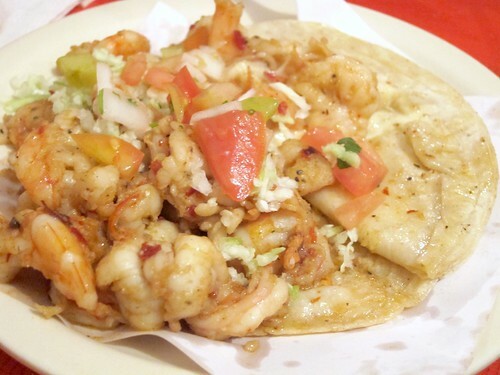 The shrimp taco to end all shrimp tacos! The meals start with a styrofoam cup of shrimp consomme. While waiting for our tacos, they served us a plate of seafood cocktail including shrimp, octopus, scallops, and more. 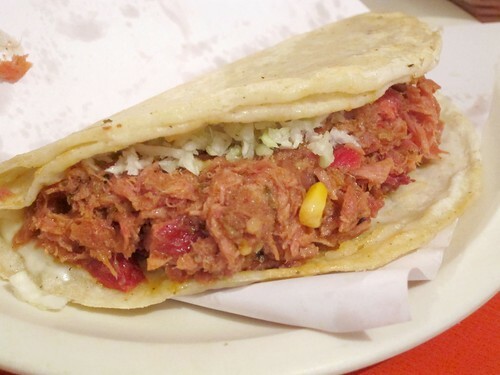 If you have room for another after the heaping shrimp taco, try the smoked marlin taco, equally stuffed to the brim. 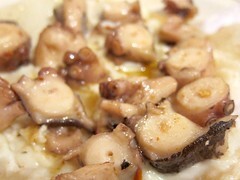 The pulpo/octopus was also popular among the other diners. The tacos here cost up to 40 pesos (around $3) and considering how much seafood you get with them, it's not bad at all. 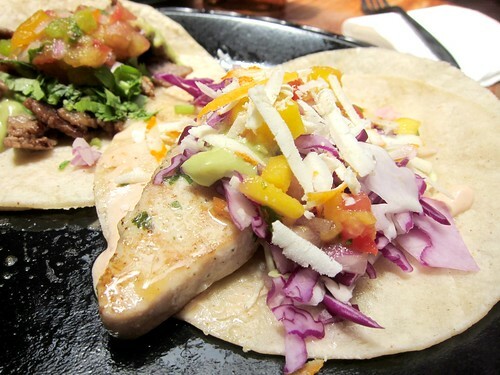 Whatever the price may be, the taco mazatena is a must try! 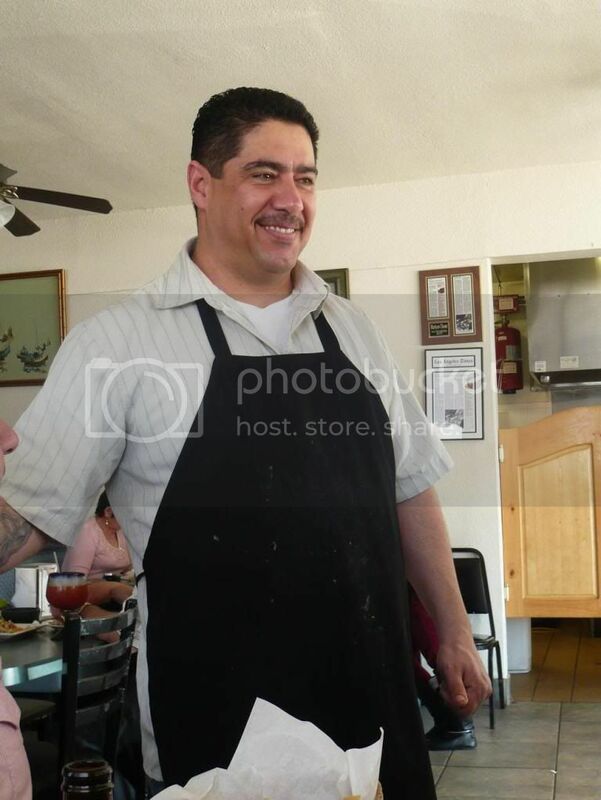 When Street Gourmet LA found out that Gastronomy Blog and I hadn't been to Mariscos Chente before our winter menu tasting, he promised he'll come with us again and introduce us to their biggest hits, so to speak. Mariscos Chente is a Sinaloan seafood haven that garnered an extraordinary amount of buzz in the past year. We all met up for lunch on V day for a major seafood feast. Street Gourmet LA said that while traditionally different people specialize in manning the grill, preparing the raw seafood, cooking the soups or the tacos, Mariscos Chente's chef Sergio Penuelas seamlessly moves between the disciplines and produces excellent dishes across the board. 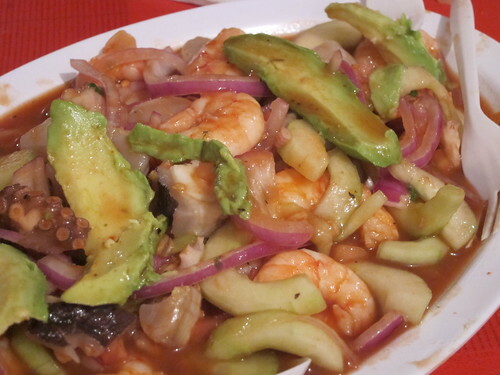 As a starter (and the first of a slew of shrimp preparations that day) was Camarones aguachile- ("chile water", $11). 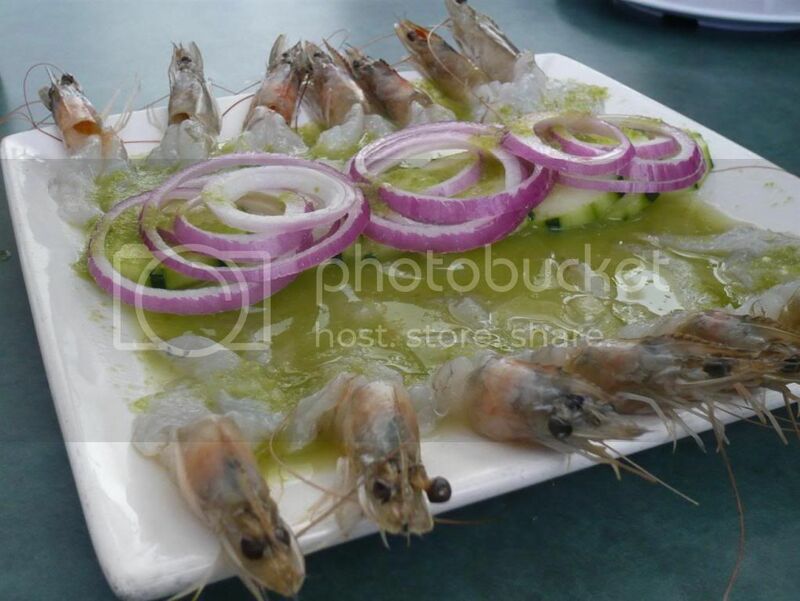 These are raw shrimp flash marinated with lime, salt, and a chile (Sergio uses jalapeno). What a start. 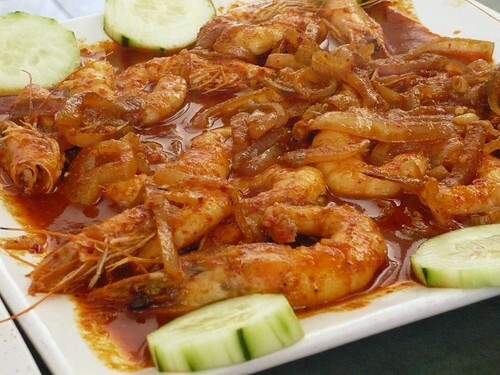 The shrimp flesh was wonderfully chewy and the combination of the tangy lime and spiciness works very well. I can see this being too tart for some people, so do keep that in mind (although I personally loved it). The owner/mother, Maddalena, travels to Nayarit every few weeks to get seafood and brings them back to LA on a bus so she can prepare these dishes with the traditional ingredients, and as we eat the camarones aguachiles that long trips seem to be so worth it. 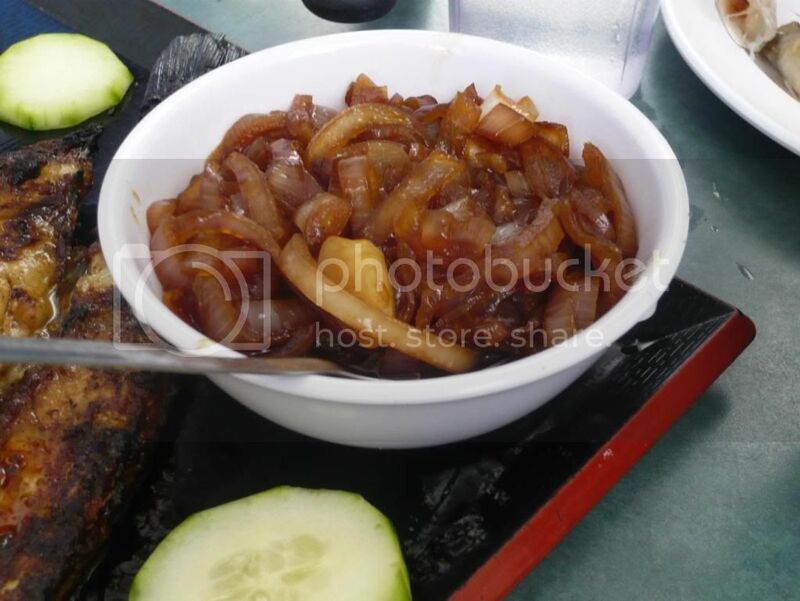 Most of the dishes were garnished with cucumber slices, which according to Street Gourmet LA is a signature Sinaloa/Nayarit garnish and make up your vegetable consumption! This was also the only shrimp dish to come with rice, as it had such bold flavors that needed to be cut with some rice. 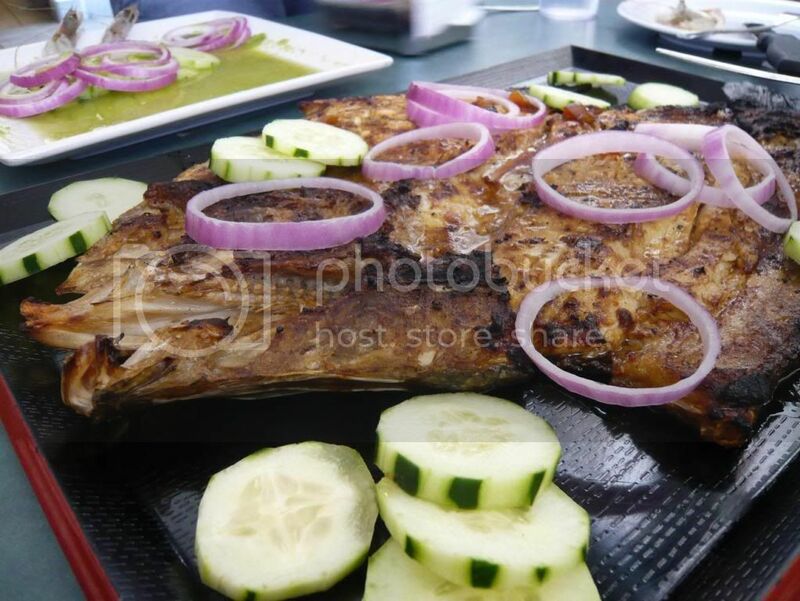 Chicarron de pescado ("fish skin", $15) chunks of tilapia panfried with the skin on in worcestershire sauce and lime. Being the first time I had a non-pork chicharrones, this was rather interesting. 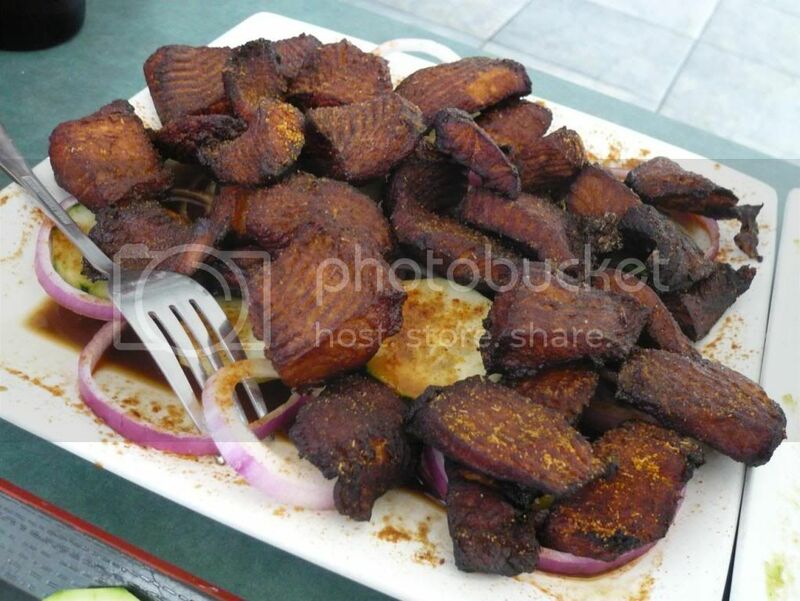 The blackened skin is crispy as chicarrones should be yet the rest of the chunks are meaty. 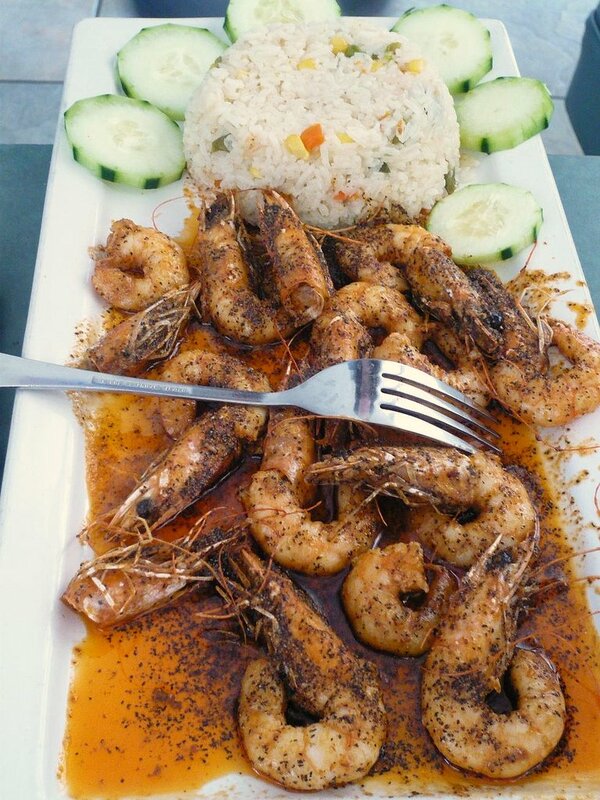 Camarones a la diabla ("Deviled shrimp", $12) is cooked in a blend of chile de arbol (tree chiles), and nuevo california dried chiles. A bit of heat in this one, but luckily I can still handle it since it would've been sad to miss out on this great dish. 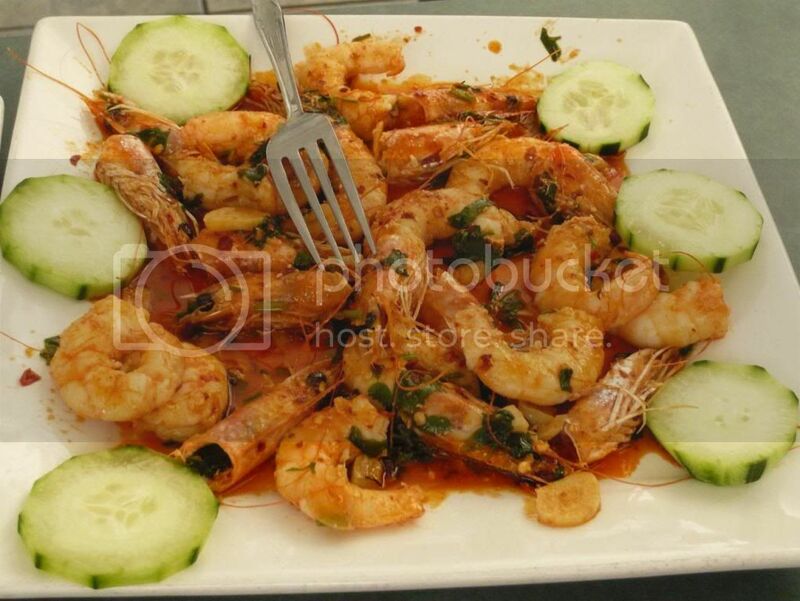 Fresh, sweet shrimp in the spicy chile sauce was a great example of why the Nayarits garnish their dishes with the cool cucumber. 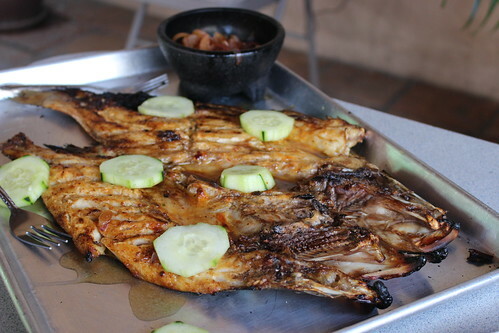 Pescado Zarandeado ($20/kg) - this is a whole grilled snook and is the state dish of Nayarit and Sinaloa. This perfectly butterflied grilled fish tasted so fresh and sweet, especially the tender and fatty cheeks. 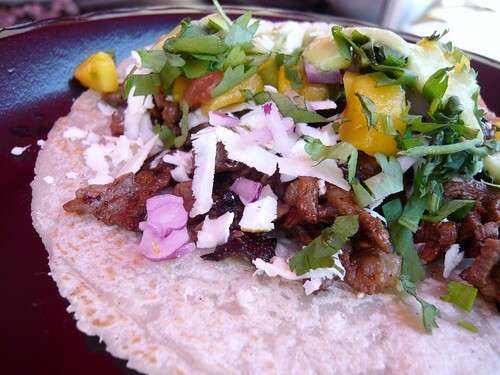 The edges are wonderfully crisped, highlighted that grilled flavor. The traditional simple marinade consists of either olive oil, mayo, or butter, with lime, spices, and garlic, but there are many recipes for this marinade and of course Sergio has his own secret recipe. This is served with a side of worcestershire sauce. Camarones Borrachos ("Drunken Shrimp", $12) is cooked in a tequila based sauce with garlic, cilantro, spices, and margarine. This was my favorite dish of the day. With the most subtle sauce (compared to the other three), I can really appreciate the freshness and the flavor of the shrimp itself, yet enhanced even more by the amazing buttery, garlicky tequila sauce. Street Gourmet LA claimed that he had gone to every Sinaloan seafood restaurant in LA, and that Mariscos Chente was hands down the best. 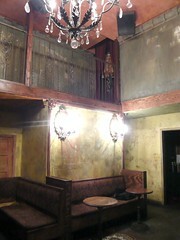 I certainly haven't made my rounds, but I can believe it that this is the best. Well, it doesn't matter anyway as Mariscos Chente's food will speak for itself. I don't know why I took so long before going there, but if you're one of those who are taking even longer, get yourself there already.